Last Call For Applicants to the LPD 2019 Citizens Academy! The Lynnwood Police Department’s 28th CITIZENS ACADEMY. Deadline for Applications is December 15, 2018. LYNNWOOD, WA (December 4, 2018) – The Lynnwood Police Department will be offering a 14-week Citizens Academy this upcoming January, which is a unique learning experience conducted by the police department and designed to give citizens a better understanding of the mission, values, and operations of the police department. 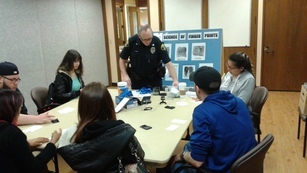 Below: Sgt Josh Kelsey leads participants on a fingerprint extraction exercise. During this interactive course, participants will be introduced to the basic information that all police officers must know to perform their jobs, including patrol tactics, criminal and narcotics investigations, use of force, communications, DUI procedures, and domestic violence to name just a few. This is a great opportunity for those interested in the fascinating field of criminal justice, current trends in criminal activity, personal safety, crime prevention, and volunteering with our agency. The course is from 6:30 to 9:30 p.m. every Thursday starting on January 10, 2019 at the Lynnwood Senior Center, 19000 44th Ave. W.
This class isFREE. Light refreshments are served. Space is limited, so early enrollment is strongly encouraged. A LIMITED AMOUNT OF SEATING WILL BE AWARDED TO HIGH SCHOOL SENIOR APPLICANTS.